Our Abpromise guarantee covers the use of ab27992 in the following tested applications. Flow Cyt: Use 10µl of the suggested working dilution (neat - 1/10) for 106 cells in 100µl. Expressed on cortical thymocytes, epidermal Langerhans cells, dendritic cells, on certain T-cell leukemias, and in various other tissues. Cell membrane. Endosome membrane. Subject to intracellular trafficking between the cell membrane and endosomes. Localizes to cell surface lipid rafts. 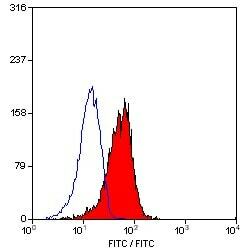 FACS analysis of CD1a expression in MOLT4 cells using FITC conjugated ab27992 at 10µl for 106 cells in 100µl. Publishing research using ab27992? Please let us know so that we can cite the reference in this datasheet. There are currently no Customer reviews or Questions for ab27992.